Starting 1 April 2019, the “bleeding meat” Impossible™ patty will be available at VeganBurg 44 Jalan Eunos Singapore. All VeganBurg burgers can be hacked and mixed and matched with the Impossible Patty by topping-up $4. VeganBurg becomes the first plant-based QSR to serve the Impossible Burger by far in Singapore. VeganBurg’s menu is 100% vegan, with gluten-free and halal-friendly options. Their menu features fresh ingredients and East meets West inspired flavours. VeganBurg was launched back on 10 October 2010 in a humble outlet in Jalan Eunos and is now home to millions of fans worldwide. Some of their biggest fans are Chrissie Hynde (The Pretenders), Steve Aoki, Belinda Carlisle (The Go-Gos), Tara Stiles, and Deftones. 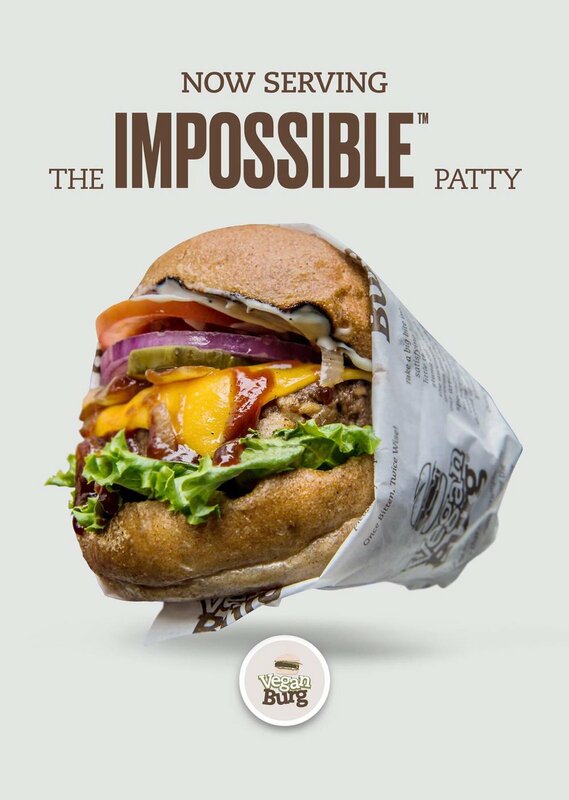 SINGAPORE, 1 April 2019 —The Impossible™ Patty will finally make its fast-food debut today at Singapore's pioneer plant-based burger joint, VeganBurg. For starters, they can order the Impossible Smoky BBQ Burger. The powerhouse “bleeding” plant-based burger will be topped with vegan cheese, smoky sweet BBQ sauce, garden-fresh lettuce, caramelised onions, tomatoes, pickles, and creamy vegan aioli - all stuffed in a wholemeal bun. For the ultimate hack, you can add vegan bacon and vegan egg for extreme “meaty” flavour. The award-winning burger patty from Impossible Foods will provide an exciting new option for VeganBurg’s fans. “We’ve been around since 2010 and we’re growing exponentially. As a proudly Singaporean born and bred company, we are very excited to have an array of plant-based options in the country. We’re happy to call our brand Singaporean, people from all over the world head to our Eunos outlet to experience the unique burger vibe. Since 2010, Singaporeans and tourists have the opportunity to complete their experience with a plant-based burger. Not only that, we are also a great complement to what Singapore is known for, food, technology, and innovation“ says CEO and Founder Alex Tan. “We combine the Singapore entrepreneur spirits and our Singaporean steadfast business ethics. Those 2 characteristics are the key ingredients in making a strong business venture” he added. The brand founder, Tan, leads a mission to inspire and excite the world to choose a plant-based diet as a means of planet restoration and as a way to combat climate change, all with the help of like-minded individuals and his family. Based in Redwood City, California, Impossible Foods makes delicious, nutritious meat and dairy products directly from plants — with a much smaller environmental footprint than meat from animals. The privately held company was founded in 2011 by Patrick O. Brown, M.D., Ph.D., formerly a biochemistry professor and Howard Hughes Medical Institute investigator at Stanford University. Investors include Khosla Ventures, Bill Gates, Google Ventures, Horizons Ventures, UBS, Viking Global Investors, Temasek, Sailing Capital and Open Philanthropy Project. Impossible Foods discovered a scalable, affordable way to make heme without animals: the company engineers and ferments yeast to produce a heme protein naturally found in plants, called soy leghemoglobin. The heme in the Impossible Burger is identical to the essential heme humans have been consuming for hundreds of thousands of years in meat — and while it delivers all the craveable depth of beef, it uses far fewer resources. The Impossible Burger is produced without hormones, antibiotics, cholesterol or artificial flavors. It uses about 75% less water, generates about 87% fewer greenhouse gases, and requires around 95% less land than conventional ground beef from cows. Since 2010, VeganBurg has been redefining food pop culture and comfort food with its delectable 100% plant-based menu. The fast-casual restaurant has presence in both Singapore and San Francisco and is successfully pushing the limit and breaking the stereotype of how a burger could look, feel and taste like by mixing and matching colourful ingredients, daring flavours and gourmet sauces. Signature fan favorites include the Creamy Shrooms burger, Seaweed Fries, and Sizzlin’ Broccoli. All items at VeganBurg are 100% plant-based and cholesterol-free. For more information and updates from VeganBurg, visit www.veganburg.com. October 29, 2018 - Hot on the heels of their California franchise launch and just a week before VeganBurg embarks on LA’s Franchise Expo West, leading plant-based fast food franchise, VeganBurg, has confirmed that they have partnered with a franchisee in San Francisco. The new store will be run by franchisees Premal and Milin Patel in California with a target date to open mid-2019 eyeing a location in South of Market (SoMA) in San Francisco. The local franchisee and their team will be trained to create burgers that will excite and tantalize every Californian’s tastebuds as well as fight climate change. As one of the pioneering plant-based clean meats companies in the world, VeganBurg has opportunities for franchisees throughout California. Help is provided with site selection, interior design, initial training, marketing and promotion, constant research and development, franchise operation manual, and on-going training. As a franchise, the company will supply all the assistance needed to get your successful VeganBurg ready to flip burgers in no time. If you’re interested in joining VeganBurg’s crusade in beating climate change by owning your very own VeganBurg store, book here now to get exclusive expo access and to secure your territory https://bit.ly/2Extymf , limited slots available. Since 2010, VeganBurg has been redefining food pop culture and comfort food with its delectable 100% plant-based menu. The fast casual restaurant is successfully pushing the limit and breaking the stereotype of how a burger should look and taste like - by mixing and matching colourful ingredients, plant-based burgers with daring flavours and gourmet sauces. Signature fan favorites include the Creamy Shrooms burger, Seaweed Fries, and Sizzling Broccoli. VeganBurg highlights creative and delectable fresh 100% plant-based burgers and sidekicks. Veganizing classic popular comfort food that are close to everyone’s hearts. At VeganBurg, every plant-based burger is bursting with wholesome and natural real flavor. Every bite is not just a set of nutritional value numbers – it’s a step towards an environmentally sustainable diet. Every meal is a contribution to a better world by reducing the emissions of greenhouse gases. Franchise Expo West is the premier event covering the franchise industry for the western United States, and serves as the industry's one-stop shop for prospective franchisees. The expo will run from November 1-3 2018 at the Los Angeles Convention Center in Los Angeles California.